The game that was once played with sticks instead of clubs and a walnut for a ball has come a long way and it is constantly evolving. The tools we use today are better than ever, but some of the best things about golf are in the past. At Cinnabar Hills we hold dear the history of the greatest game ever played. When you visit our golf course you always have to opportunity to step into The Brandenburg Historical Golf Museum. We are fortunate to have one of the finest collections of golf memorabilia and artifacts anywhere. "Ike" was the 34th President of the United States from 1953 until 1961. Later in his life he became a golf enthusiast. He joined the Augusta National Golf Club in 1948. He is one of the club's most famous and ardent members. He played golf frequently during and after his presidency. He was unreserved in expressing his passion for the game. He even golfed in the cold winter with special ordered golf balls painted black so he could see them against the snow. He became close friends with Augusta National Chairman Clifford Roberts, inviting Roberts to stay at the White House on several occasions. President Eisenhower spent many hours on the lesson tee with head professional Ed Dudley. President Eisenhower was also a five-star general in the United States Army during World War II and served as Supreme Commander of the Allied Forces in Europe. As you further explore our collection, you’ll find a commemorative watch, a sand wedge, and a picture painted by Eisenhower of his grandson David holding a golf club. When you come in for you next round of golf take some time to see this remarkable item and more in person. Lee Brandenburg was stationed at Camp Gordon near Augusta National as a young lieutenant in the mid-1950s. He had read in the paper that President Eisenhower was going to be playing golf at Augusta National and he decided to investigate. He took a buddy with him and found a seldom used dirt tract that lead to the course. Lee and his buddy were apprehended by the secret service and held until President Eisenhower could play through. When the President saw the two young soldiers in uniform standing by the green he had just played, he walked over and chatted with them and, of course, told the security detail to release them. This not an isolated incident. Lee has a colorful history of sneaking into events without credentials. The list is too long to mention here. This wonderful story has been shared by Frank Christian, official photographer for the Augusta National from 1952 to 2000, and good friend of Lee Brandenburg. Francis, a great golfer, came from a poor family, never finished high school and caddied to earn extra money to help support his family. Francis was invited to play in the 1913 US Open because they needed one more player. But to let you know how little thought the USGA gave this gesture - they didn't have a caddy for him. He ended up with an 11-year-old kid named Eddie Lowery toting the bag. All was quite charming in the first couple of rounds. Then Francis not only made the cut, but played his way into contention. While in contention before the final round, Francis was asked to withdraw from the tournament. Can you imagine this? Francis, in is naivete, simply said, "Oh, no thank you, I'm really enjoying myself and would really like to finish the tournament." Finish it he did. Shooting a stunning 72 to force himself into a 3-way playoff with Harry Vardon and Ted Ray, the number 1 and number 2 golfers in the world at the time. Remarkably, Francis goes out and wins the US Open with a rascal of a caddy, embarrassing the stuffed shirts of the USGA and the Country Club of Brookline, MA. Thus, they revoked his amateur status, an act of revenge that was reversed in 1918. With Francis not collecting any money for winning, he had none to pay his caddy. Vardon and Ray decided to pass the hat amongst the gallery and ended up collecting more money to pay the caddie than the entire winning purse of the US Open, giving Eddie a major financial jump-start in his career. Eddie became a Massachusetts Amateur Golfing Champion, as well as a top businessman (and a well-known car dealer in San Francisco). Photo on the right: the statue of Francis and Eddie during the US Open. The statue is on display in the Brandenburg Historical Golf Museum. This exhibit is in the Brandenburg Historical Golf Museum for a couple of reasons. Tony Jacklin is a two-time major championship winner; he won the 1969 British Open at Royal Lytham & St. Annes and the 1970 US Open at Hazeltine National Golf Club. He was a multiple winner on three different golf tours (4 PGA tour wins, 2 European Tour victories, and 2 PGA Champions Tour wins) for a total of 15 professional wins. He was the captain of the European Ryder Cup teams from 1983 - 1987. A number of years ago, Mr. Jacklin developed a personal friendship with Lee Brandenburg. Tony and Lee visited each other, whether in Florida or California, and they eventually started playing in an exclusive Par 3 event in England. Tony has given Lee his Ryder Cup captain's jacket, which is on display in the museum. Tony is not only a talented golf professional, he also has a singing talent and has recorded a couple of albums. One of these albums is on display as well. In addition, he has created a number of unique wood carving pictures using a technique called marquetry. In our Jacklin exhibit, Jacklin's marquetry pictures of Ben Hogan, Tiger Woods, Marlon Brando, and the most important one, of Lee Brandenburg which Tony surprised Lee with during one of his visits, are on display. The trophy which Lee won during the Concession Club golf tournament at Tony's golf club a few years ago is also included. The Masters kicks off the Major championship golf season during the first week of April. Augusta National has something magical about it with the dogwoods and azaleas, perfect fairways and stone bridges. Many of us keep Augusta in mind when we create our own backyards. It’s no question that the beauty of the golf course enhances the viewer’s enjoyment. It seems everyone – from the non-golfer to us diehard fans – is entranced by Augusta National. perfect piece of land for his vision. 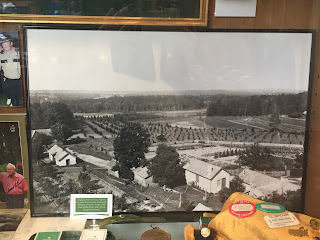 The area in question was formally the home of Berckmans Nurseries (photo), the first large-scale horticultural nursery in the southeast. Louis Berckmans and his son Prosper, immigrants from Belgium, had introduced a range of new plants to the southeast. 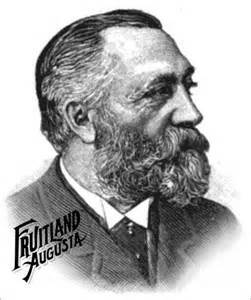 Prosper became known as "Father of the Peach Culture" after introducing and developing many types of peach varieties. The nursery operated from 1858 to 1918. Jones is said to have exclaimed “Perfect!” when he saw the land and purchased it for $70,000. Construction for the golf course began in 1931. Prosper Berckmans, Jr., and Louis Berckmans helped with the landscaping surrounding the clubhouse and golf course, and many of those plants still are the ones we admire around Augusta National today. Berckmans’ former home, Fruitland Manor, became the Augusta National Clubhouse. Nowadays, each Masters winner raises the silver trophy, which is a small replica of the clubhouse. The life size replica trophy is on display in the Brandenburg historical golf museum. Jones, who built Augusta along with his friend Clifford Roberts, had been dreaming about a private club where members could play without being bothered by the media or fans. He started writing letters to friends and acquaintances, spreading the word about his plans. Below is one of the original letters displayed at Cinnabar Hills, in which Jones is asking Mr. Crawford Johnson if he was interested in becoming a member. If you aren’t familiar with Mr. Johnson's story, he was the clever man who purchased the exclusive franchise rights to bottle and distribute Coca-Cola in 1902. Bobby Jones and his friend and fellow founder of the golf course, Clifford Roberts, hired the famous architect Alister MacKenzie to help with the design of the golf course. How Jones and MacKenzie met is still a bit of a mystery, but it turned out to be a perfect match. They would together wander the properties, planning each golf hole, and Jones would often toss out a golf ball and hit a shot to where the green was going to be. They would make adjustments as needed. Next time you stop by Cinnabar Hills, take a look on the wall by the torphy cases. 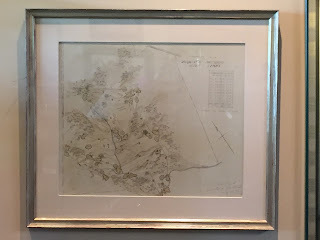 One of MacKenzie's early drawings of Augusta National is displayed. We consider ourselves quite fortunate to have this piece of memorabilia under our roof. This is a set of 3 flicker books originally produced for Harrods of London in the 1920’s. Because of the smooth rhythmic swing of Bobby Jones and his successful amateur career, his swing was the standard to copy. There were a number of different items that Bobby Jones endorsed to show his smooth flowing swing. Initially, there was a movie that taught different types of shots. From the movie came the three volume flicking books that showed the action frame by frame. By bending the pages and flipping through them a person could see the complete swing. Book #1 shows Jones's swing with the Driver and Mashie clubs. Book #2 shows shots from the rough and putting. Book #3 shows Brassie and Iron play. While these are duplications of the original books, they are very hard to find in any collection. The US Amateur replica trophy was added to the collection in 2010. This was able to be attained due to the friendship of Lee Brandenburg and Sam Randolph, who won the tournament in 1985. Upon the completion and receipt of the initial 5 trophies, Lee Brandenburg held a special Media Day in which he invited one winner from each of the tournaments to attend, come by to see the photo in the museum. The professionals in attendance were Bob Goalby, Bob Rosburg, Doug Sanders, Tony Jacklin and Billy Casper. This famous Claret Jug Trophy was made in Edinburgh in 1873. The first British Open was played in 1860 and the winner was presented with a Moroccan leather belt. The first Claret Jug trophy was presented to the 1874 champion, always referred to as the “Champion Golfer of the Year”. The original Claret Jug still resides at the Royal and Ancient Golf Club. Horace Rawlings captured the first U.S. Open title in 1895 at Newport Golf Club in Rhode Island. Rawlings’ winnings included $150.00, gold medal and a one-year entitlement to the sterling silver championship trophy. The original cup was destroyed in a fire at Tam O’Shanter Golf Club in Illionis in September of 1946. The USGA decided to preserve the look of the original trophy and presented a full size replacement in April of 1947. In 1986, this replacement was retired to its present home in the USGA museum in Far Hills, New Jersey. The Rodman Wanamaker Trophy is the famed prize of the PGA Championship and one of the largest trophies in golf. Wanamaker, a New York City department store owner and son of founder John Wanamaker, donated the trophy and the $2,500 purse in the inaugural PGA Championship in 1916. The original trophy resides at the PGA of America headquarter in Palm Beach Gardens, Florida. The Masters Trophy depicts the clubhouse at the Augusta National Golf Club in Augusta Georgia. The trophy was introduced in 1961 and contains 900 pieces of silver. The Masters Champion receives a sterling silver replica, one-quarter the size of the original, a gold medal, and the famed green jacket. The original trophy stays on the grounds at Augusta National at all times and is only moved to a special viewing area for the tournament week. This famous trophy was originated in 1927, when the Ryder Cup matches were introduced. The idea of a match play competition between the United Kingdom and the United States was the idea of Samuel Ryder, who sponsored the event. The original trophy was solid gold and has been retired and a replica of sterling silver and gold gilt is now used for the event. In 1979 the British Team was expanded to include European professionals and that is how it stands today. It is played every two years with alternating host countries. This trophy is named after Theodore A. Havemeyer. He was president of the USGA in 1895 and volunteered to fund the creation of a suitable prize for the Association’s most significant championship. Havemeyer, a Wall Street sugar baron, stipulated during the March 28, 1895, meeting of the Executive Committee that the trophy be a perpetual one and shall be “held for that year by the club from which the winner shall have entered.” The Amateur is a revered among national championships because it embodies the foundation of the USGA and the purest form of competitive golf. No big-money purses, endorsements or giant egos – just a love of the game. The tournament now known as the AT&T Pebble Beach Pro-Am started out in Rancho Santa Fe, California when Bing Crosby invited some friends to play golf, enjoy a clambake and a raise a little money for charity. Crosby came up with the idea of staging a pro-am competition to give Lakeside members and some other low handicap amateur golfers a chance to play with 50 or 60 professionals who were on the west coast during winter months. Crosby selected Rancho Santa Fe Golf Club as the site for the first tournament in 1937 and was limited to 18 holes. Sam Snead won the initial tournament with a 68, while he and his partner, George Lewis, won the pro-am section with a 68. After starting with some 60 players, the 1941 field grew to more than 300, necessitating two days for the first round. The final tournament at Rancho Santa Fe was held in 1942 with Lloyd Mangrum and Leland Gibson listed as co-winners of the event, even though an amateur actually was the low score. The core of the tournament revolves around the exceptional golf by the world’s best players, the ability of amateurs to compete with the professionals and the lore surrounding the presitigous event. Part sporting event and part Northern California social event, the AT&T has a devoted following, including thousands of volunteers who give their time year in and year out. Many have been inducted into the Forty Year Club for their volunteer service. For many years, The Crosby, as it was officially known then, was a gathering of professionals and friends of Bing Crosby. Each year many would put on a special entertainment night for the volunteers. This special night became known as the Clambake and fun was had by all. Entertainer Phil Harris, a pal of Bing Crosby’s, is credited with setting a certain tone by accompanying his golf with a glass of his favorite whiskey. One year Harris announced that he was the pro from “Jack Daniels Country Club". For years, the tournament was played at Pebble Beach Golf Links, Spyglass Hill Golf Course and Cypress Point. Poppy Hills Golf Course replaced Cypress Point and then a couple of years ago, the tournament moved to Monterey Peninsula Country Club, replacing Poppy Hills Golf Course. The format continues to be the same as when Bing Crosby started with one professional and one amateur playing three days together to qualify for the low 25 teams to play in the Sunday field. The tradition and the lore of the tournament continues every year and is one of the fun events on the PGA Tour.